... just 35 people submitted petitions for pardons and another 12 applied for commutations to shorten their sentences. The combined 47 applications stands among the fewest in the last decade, though by year’s end could pass the 48 turned in in 2013, and the 49 in 2006, Mitt Romney’s final year in office. It is suggest that the election of Democrat Patrick,"a former Department of Justice civil rights attorney" may have "spurred hope for more pardons" So, 131 applications arrived in the first year alone. 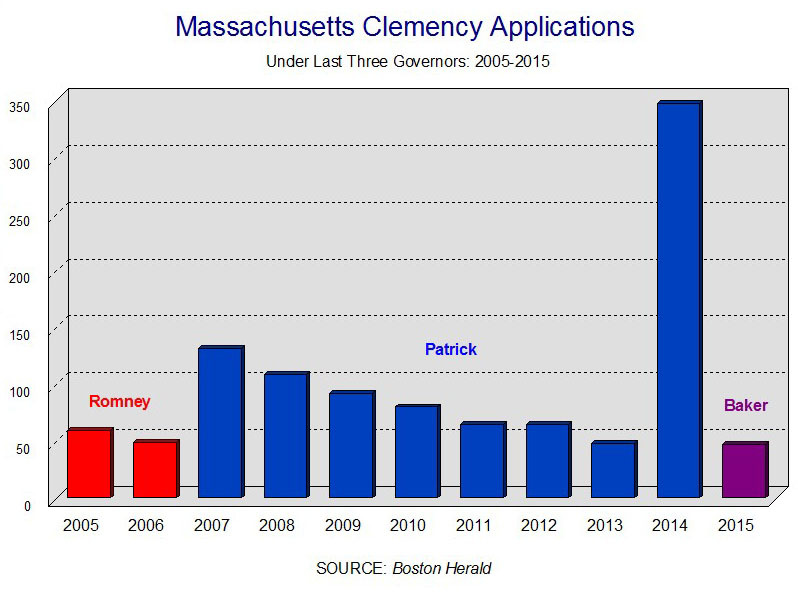 Patrick then "remade" clemency guidelines twice (in 2014). This sparked "another flood." The Herald suggests pardons "are often viewed as politically prickly, particularly in Massachusetts" and they are "often" left for the "final days" of office, if there are any at all.